Exclusive 15% off the Prime Fifty range. A healthy, well balanced diet combined with exercise is key to making the most of our life in the prime of our life. But real food intake studies show most of us are lacking both protein and many key micronutrients and therefore supplementation with a well formulated range of supplements, tailored specifically to the over 50s and beyond, is a healthy addition to our diet. 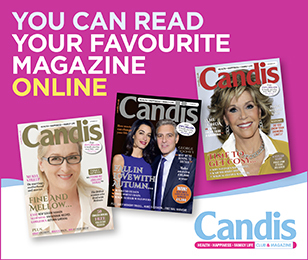 Click Here or call Prime Fifty on 07383 443625 and quote discount code: CANDIS15. A survey carried out by Prime Fifty of 1,000 over-50s, -60s and -70s revealed that the number one priority for older adults as they age is to remain active and mobile. They also want to maintain energy levels through the day. This means looking after our musculoskeletal health, which is all about bone strength, healthy joints and, of course, ensuring our muscles are in tip-top condition too. Older adults, especially women, lose bone density/strength as they age, but this can be guarded against by ensuring they get the right nutrients. Joint problems are also a common ailment among the over-50s, but these can also be supported with the right nutritional inputs. Muscle strength and muscle mass are critical as we age. Most people don’t realise that we lose around a quarter of our muscle mass before 65 and this accelerates further, unless we do something about it. We also need more protein and more exercise to inhibit this. Diet studies tell us that over-50s are also not getting the recommended allowance of many nutrients in their diet, including vitamins D, E, C, folate, riboflavin, zinc and potassium. Protein intake was also found to be too low in many older adults to support declining muscle mass. Each product formulated by Prime Fifty contains a ‘healthy ageing blend’, designed to also add additional nutrients that are relevant to the ageing process, such as Vitamin D, folic acid, B12 etc. All the products also contain natural nutrients that help the ageing gut absorb these crucial micronutrients even more effectively, so ensuring you get the very best from these formulations. Redeem online by entering the discount code at the checkout or quoting the discount code when placing a phone order. Valid from 1/12/2018 to 30/11/2019 inclusive. The offer can only be used by the recipient and is not transferable. The offer cannot be used in conjunction with any other offer or promotion and cannot be exchanged for cash. The offer cannot be used for the purchase of gift cards or gift vouchers.. Normal refund policy applies. Prime Fifty reserves the right to withdraw this offer at any time.